Women and cycling have not been a traditional mix in continental cycling. Like any monk devoted to God, a cyclist was to solely contemplate the redeeming crucifix of handlebars and top tube. Even today recent surveys have shown that European pros are absent from their homes for half of every year. Partly this is from necessity. A traveling team has no room for extras. But also there is a feeling that women are a distraction which can hardly be allowed in one of the most difficult disciplines ever devised by men. Certainly that was the case with the remarkable Pélissier brothers. They came from a long line of hard working, one might say almost obsessively hard working men who were accustomed to being the family patriarchs. To père Jean, alternatives to his role were inconceivable. At the turn of the twentieth century he was up at four every morning milking his cows. All day he toiled to make his modest Parisian suburb dairy successful, and at night he dined apart and slightly above the rest of his family as befitted a medieval baron in his castle. Cas, mother of a brood that eventually grew to five, never complained. She had been a orphan who had gone to work at a cafe at an early age. Jean had always been the first customer in the morning. "He impressed me with his blue eyes, his erectness, and above all, his air of self-confidence," she recalled. "It was easy to see that he knew what he wanted and how to get there. When he asked me if I was interested in him I couldn't say 'no'. With him I knew I had a solid shoulder. What I feared most was being forced to work in a factory, like so many others, from six in the morning to seven at night." Not a story that would cut it in modern romance novels, but a familiar tale to millions in those days. At least Jean and Cas knew what was expected and little friction resulted. Only when the limitations of routine broke down did some of the underlying feeling and confusion emerge. Cas remembered the moment Jean entered her room, February 20, 1903, just as she had given birth to Charles. "He came in, radiant. 'Nom de Dieu,' he declared, 'it's a son.' And then he looked at me, the blood drained from my face, and fatigue written across my whole body. 'Don't cry,' he said with emotion in his voice. 'He is the fifth and he will be part of the soup like the others, and maybe he will be the one to take care of us in our old age.' Though I didn't say so, it wasn't for the child that I cried, it was for myself, but that would have been too complicated for him." Just as he expected certain things of his wife, Jean expected certain things of his children. Henri, the eldest (born 1889) would, of course, take over the family business. By age ten Henri was up with his father and out to the barn. Henri's job was to deliver the milk to 600 clients. All this before breakfast and before school. Henri was the first to admit, "If nothing else, the school of Pélissier formed character." It soon be came clear, however, that Henri's character would be formed by life on two wheels, not under four udders. Père Jean took a while to realize this, but when he discovered Henri was slipping off to bike races, he exploded. Henri's days at home were numbered. In time he set some money aside and left home to seek his fortune in the races. It was hard, of course, but Pélissiers were nothing if not stubborn...and successful. By the outbreak of World War I Henri had finished second in the Tour de France, won several classics, and was obviously the star ascendant. Père Jean determined not to lose another son to such foolishness. He practically put brother Francis in a cage, but again there was no cure for the bubonic bike bug. Daughter Augustine was DNS in the successor competition, girls being ineligible. Jean François was DNF thanks to his sacrifice for father France in the war. That left little Charles. By this time, 1919, père Jean had moved with the times, from udders to carburetors. Now Charles was to be the junior "commandant" of the garage. Yet, as Charles said, "This poor dear man never understood that I never wanted to do anything other than be a racing cyclist, like Henri and Francis. My fiancée was the bicycle." Here and there Charles got in enough training to do well in the local races and by the next season he had enough money saved to escape to the other side of Paris where the big guns trained. Between his performances and his name he soon had that most hallowed of possessions, a contract. Charles never had any illusions about rivaling his illustrious brothers. He knew he didn't have their kind of talent. He was content to rise through the ranks and play an important role...until midnight, the 22nd of April, 1923. Rain poured down as he and the other participants in the Paris–Brussels classic hid until the last moment in the Cafe Dagorno. The thought of 400 kilometers and 17 hours in the saddle in these conditions kept the men quiet, each attempting to savor the last minutes of warm repose before the call to the line. And then, a young lady entered the cafe. Charles checked her out. "Yes, very pretty," he thought, "eyes like a doe. But her dress is loud and her intentions are only too obvious. No, I have no desire to make any infidelities to my little queen, the bicycle." Through the long night, though, he remembered her, her perfume and her well-proportioned "chassis" as he called it. Some of the other riders knew her and he learned her name was Leone. She evidently remembered Charles, too, because within a week she managed to get his friends to trick him into meeting her. Charles resisted, but she knew it was only a bluff. At twenty years of age he had needs even his "little queen" couldn't satisfy. "The grapevine has phylloxera [a vine root louse that plagued vineyards around the world at the turn of the century] Charles Pélissier has the 'crobe. Here we have a young cyclist full of the qualities which should allow him to follow the path traced by his brothers. A brilliant career stands before him. Yet he has succumbed to the first temptations of his life. "He is the last to complain. Thanks to her, life has never been sweeter. No more the austerity of training, no more suffering with the hands welded to the handlebar. And no more is Charles Pélissier a racing cyclist." "My mother was horrified," Charles lamented, "and my brothers covered me in sarcasms, demanding that I choose between being a racing cyclist and the attentions of the 'worldly mackerel'". "After every defeat, after every race abandoned, I would rage against myself and Leone. I made firm resolutions. I would end it with her and fully devote myself to racing. But she knew how to wait, and at the right moment she would wrap me in her arms, rock me in the other directions, and I would only too happily concede." Salvation came the following February (1924). It was an unexpected but simple solution. Charles received his notice for military service. Translated, that meant he could race on a government subsidy. Officially, he was a corporal in the "cycling pickets". The summer passed in a delirium of pedaling intensity. After six months he returned to his Parisian apartment on a short leave. Leone, her radar ever alert, arrived around midnight. Charles resisted for 48 hours. "I have recovered my calling," he asserted nobly. "Here is a pin. I give it to you as a souvenir of me, and us. And now, I beg you, leave!" She left. For two days. She returned, overnight bag in hand. Charles was back on a roller coaster. "During the races I thought of Leone, and during the nights with Leone I criticized myself for my poor performances." Justifiably or not, Charles began to suspect that Leone derived a certain pleasure from manipulating him. Then one day 1,600 francs disappeared, two months salary. The perfume wasn't so sweet anymore. One afternoon they met by a river to talk things over. "We could still be friends," she purred as she began rubbing his leg. Charles exploded. "Don't touch me! If you do I'll throw you in the water." The verbal war was on. "I'd like to see you try!" Leone scratched back. Charles looked to the right, then to the left. No one in sight. "The next thing I knew," Charles remembered, "I had my hands on this opulent vase that I had so often caressed and a moment later she was flying toward the water." Before she could surface for water and epithets he was in the saddle, sure that his "little queen" had been finally restored to her rightful place. Charles Pélissier rode as a professional from 1922 to 1939. During that career he won 16 Tour de France stages, including eight in 1930. He was also second in the 1930 Tour seven times. Eight stage wins in a single year remains the record, tied by Eddy Merckx in 1970 and 1974 and Freddy Maertens in 1976. 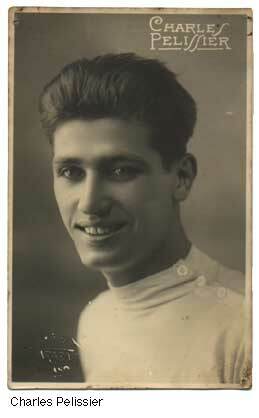 In 1926, '27 and '28 he was French cyclo-cross champion. Pélissier died in Paris May 28, 1959.